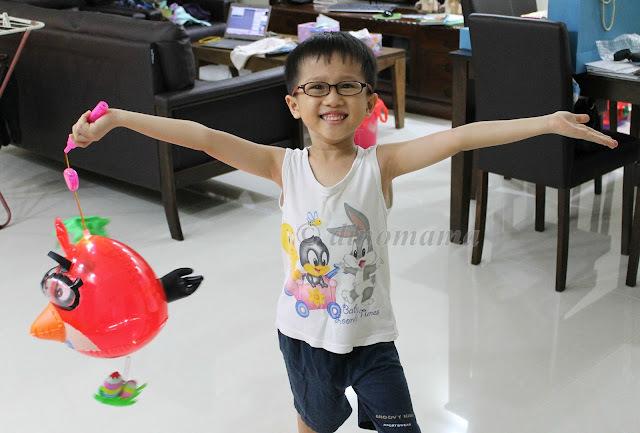 He set his eyes on the battery operated Red Angry Bird plastic lantern with its flashing light and super duper irritating loud music; we have NEVER like such lantern as its too noisy for our liking. We tried distracting him, telling him that there are more lanterns at the next shop and the next shop and the next shop (you get the idea), steering him away from this noisy one and towards a silent & more traditional lanterns. He would not have it, gave us a sad face, "No nice lanterns here" he says, so we relent. We got one for him BUT not before telling him that he can only play the music when he is outside the house. 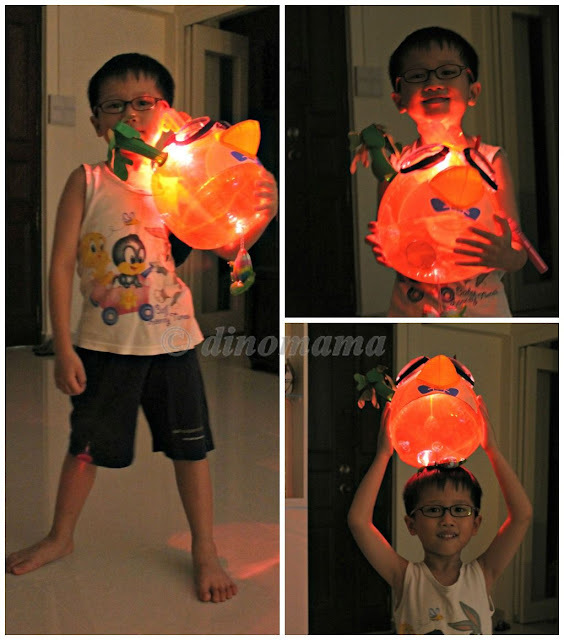 Today is Mid Autumn, though it rained heavily earlier I asked DinoEgg if he wants to go downstairs with his Angry Bird lantern, walk around and have some fun with other kids' & their lanterns. Surprisingly he don't want to go, he says he wants to do it at home. 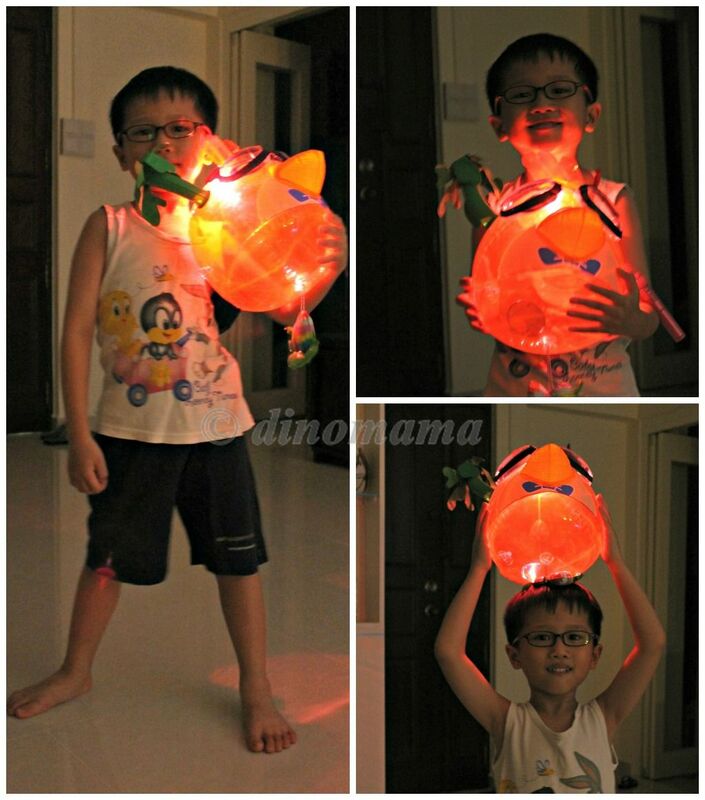 So with DinoPapa sleeping in the room (we close the room in case the loud music wakes him up), I switched off all the lights in the house and let him have some fun with his new lantern; music & lights. He had a great time dancing to the music, shaking him bum-bum to the rhythm, I whipped out my camera and start clicking away. After some dancing, he got tired and poses for me instead. 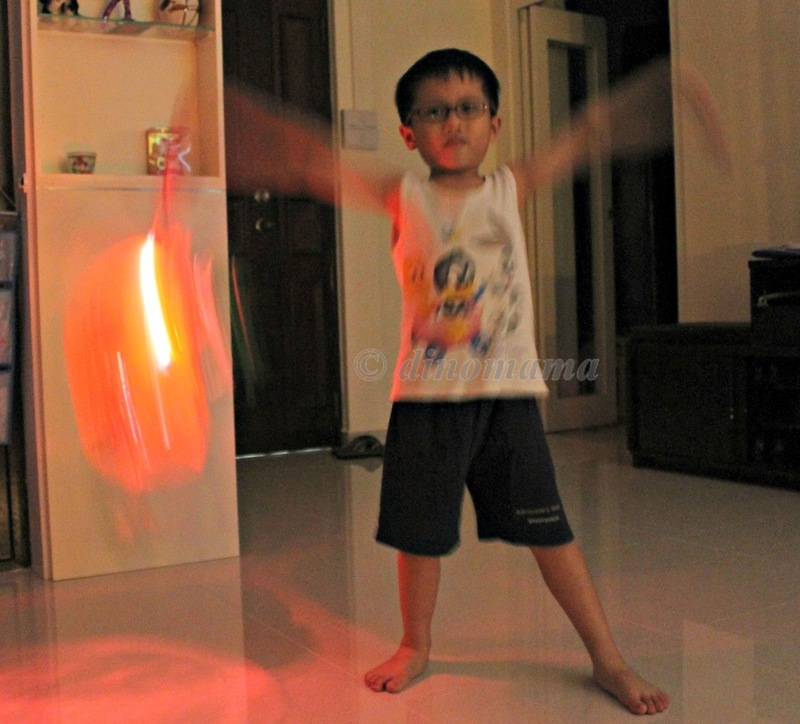 I was having some fun with my camera too, playing around with the slow shutter speed. The finale & the ending pose with a SUPER BIG SMILE! 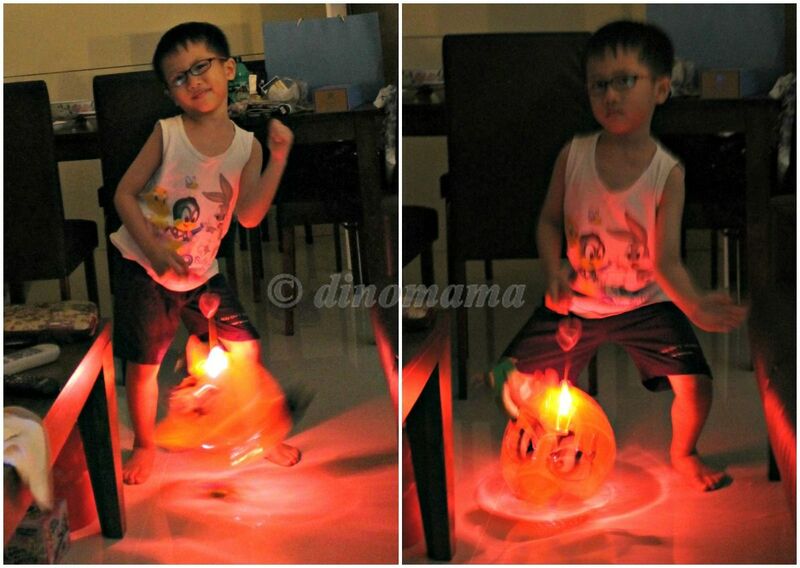 A happy boy with his Angry Bird lantern. 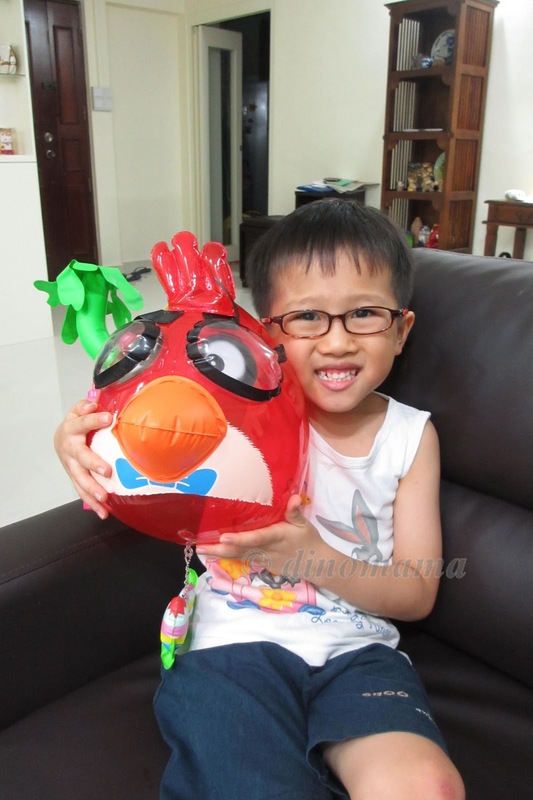 What's with kids and their love for Angry Bird? Sophie has one angry bird lantern too from last year which play music that is too loud! I do not like those battery operated lanterns as they are too commercialized n too loud. Why must blast the latest adult song in full volumn? Why cannot put kids song? Try putting a scotch tape on the speaker to muffle the sound a little bit.